A bright yellow wildflower found in calcareous (alkaline) soils on well drained grassland, fairly common and widespread where soil conditions are right in the south and East of England, but becoming less common further North. The five petaled yellow flowers appear May-September, around 15-25mm in size often in clusters. 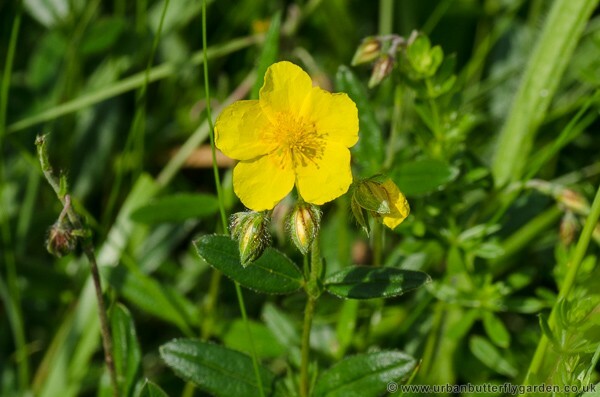 The Common Rock-rose, provides a good nectar source for Bees and other insects, it is also a primary larval food-plant for the Brown Argus, Green Hairstreak, Northern Brown Argus, and Silver Studded-Blue Butterflies. Habitat: Dry Grassland, Rocky areas. Photographed : 23rd May 2010.